The ACO (Automobile Club de l’Ouest) announced that the full squad of four Ford GTs will compete at the 2017 Le Mans 24 Hours, one year on from the marque’s triumphant return to the endurance race that everyone wants to win. 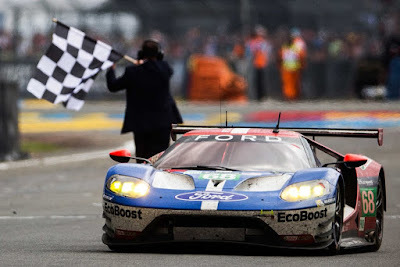 The Ford Chip Ganassi Racing team’s 2016 victory came 50 years after a historic 1-2-3 finish for Ford at the 1966 Le Mans 24 Hours. Ford also won the race in 1967 when Dan Gurney (US) and AJ Foyt (US) piloted the Ford GT40 to victory, giving the team another target to hit this time around. New to the team for 2017 is young Brazilian, Luís Felipe “Pipo” Derani, who will join Andy Priaulx (GB) and Harry Tincknell (GB) in the #67 Ford GT for the FIA World Endurance Championship races at Silverstone, Spa and Le Mans. The 23 year-old came to Ford’s attention in 2016 when he won the Rolex 24 At Daytona and the Sebring 12 Hours on his debut, marking himself as one to watch. The winners of the Rolex 24 At Daytona, Joey Hand (US), Dirk Müller (GER) and Sébastien Bourdais (FRA) will defend their historic 2016 Le Mans victory in the #68 Ford GT. The sublime squad proved with their two 24-hour victories that they are very hard to beat.